Promotion of Population Welfare motivational services by establishing contracts with the clients at all levels. Promotion of Family Health Services, Clinical and Non-clinical contraception through Family Welfare Centres and those reproductive Health Service Establishments located in the Provincial Government Hospitals and particularly provision of Services for rural areas. Promotion of Population Welfare Motivation and Services through line departments of the Provincial Government. Supply of contraceptives and medicines to the desirous clients in urban and rural areas of the districts through agencies involved in the programme. Implementation of publicity and communication strategy. Promotion of community involvement and active participation in Population Welfare Programme Activities. Coordination of Population Welfare Programme activities with other nation building departments at district and local levels. Setting up of Advisory Management Committees at Family Welfare Centres level and Population Welfare Councils at district and Provincial levels as provided in the Population Welfare Plan 1981-84. Any other activity of the Population Welfare Programme that the Provincial Government may specify. 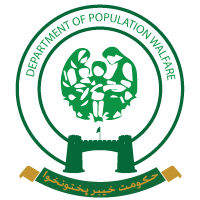 Planning & Development policies for the Population Welfare Program in the Province. Monitoring Activities and evaluation of Population Welfare Program. Mainstreaming Population factor in development planning process at Provincial and District level. Forecasting acquiring and storing contraceptives dispatching supplies of Contraceptives to stakeholders. Training in the field of Population Planning in Pakistan and abroad. Technical coordination and formulation of Policy governing the manufacture use and quality control of contraceptive material in the Province under the Population Welfare Program. Research in different apects of the programs such as clinical social, communication and demography. Social Marketing of Contraceptives and infrastructure institutions. The introduction of financial and regulatory incentives and disincentives favoring Population Planning. Administration of Regional Training Institutes and multi-purpose Service Centre.